Our Marina brown sofa features an upholstered in rich leather for that buttery soft feel and rustic appeal. Plush arms and high character details such as box stitched cushions and detailed bun feet evoke casual charm. Deep seats and sumptuous cushions make this Sonney Mocha Sofa/Chaise feel luxurious. Side pillows soften the look, while rolled arms and a simple shape keep it contemporary. Perfect to lean back and relax in, the Sonney includes a chaise that makes an inviting spot for an afternoon nap or snuggling up with a throw and a favorite book. The Warren Charcoal Sofa really utilizes techniques to bring out the luxurious details. This sofa is ideal for relaxing with friends and family or spending quality time with your significant other. Create a room that exudes style no matter where you live with the help of the Padre Almond Sofa. Warning: The luxurious almond leather look polyester fabric on the outside just might cause you to linger for hours. Relax and enjoy the view from this handsome earth tone accent chair. Retro-inspired, contemporary style is epitomized with this Revolution Glacier Sofa. 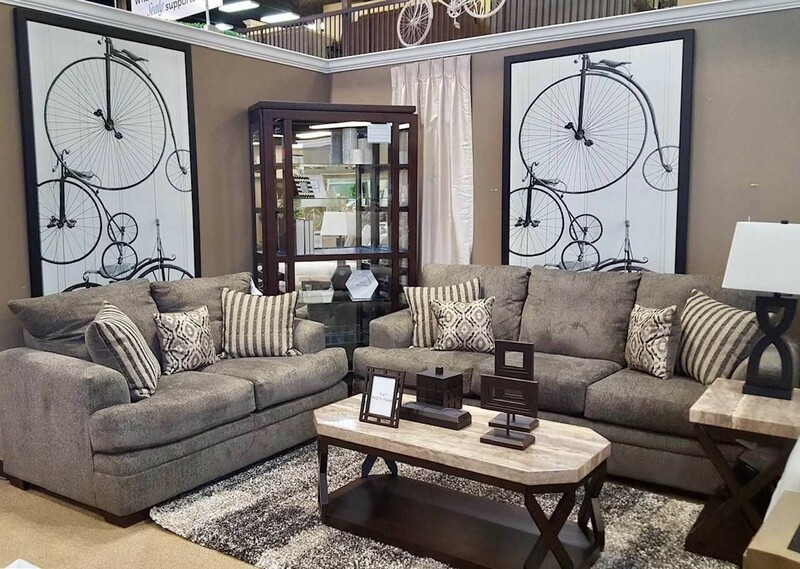 It offers a great look to your living room with loose back cushions with button-tufting, reversible box cushion seat cushions, and track arms.